Fall Up North is just gorgeous. 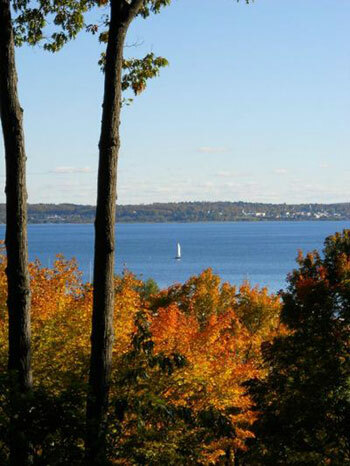 With a range of color--and a variety of fall activities--Northern Michigan is the place to be to enjoy fall foliage. Late September Early Color with some isolated peak color in Northern Lower Michigan. Nice blend of greens with fall color. Early October Early Color to Peak Color. Many fall events take place the first two weekends of October when the color peaks. The color is more intense away from the lake shore. Mid October Peak Color particularly inland. Good color along the lake--a perfect weekend for a drive along the Tunnel of Trees. Late October Peak to Past Peak Color with the best of the remaining color near the lakeshore.